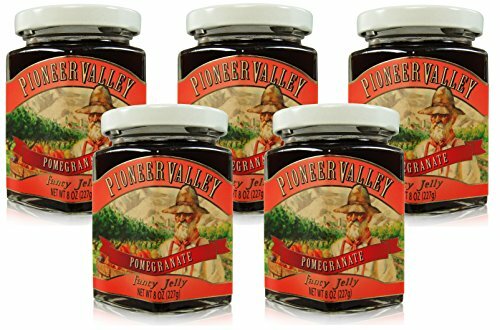 Pioneer Valley Gourmet Fancy Jelly are rich, flavor bursting, fruit/vegetable Jelly made with real ingredients containing No preservatives, no artificial flavors, and no thickeners. Each Jar of Fancy Jelly comes in a beautiful 8 oz. hex jar. Pioneer Valley is a family-owned company making each Fruit Jelly handcrafted with care in small batches for the best quality. Made with pure pomegranate juice with a sweet flavor. Pioneer Valley Gourmet Fancy Jelly are rich, flavor bursting, fruit/vegetable Jelly made with real ingredients containing No preservatives, no artificial flavors, and no thickeners. Each Jar of Fancy Jelly comes in a beautiful 8 oz. hex jar. Pioneer Valley is a family-owned company making each Fruit Jelly handcrafted with care in small batches for the best quality. We know you love Pioneer Valley Jellies and Jams as much as we do so it is now sold as a 5 Pack! Why are we selling this item as a 5 Pack? Because we want to provide you with the absolute best value and lowest cost per unit possible. We have many configurations of Pioneer Valley Gift Sets so you can get the perfect fit for you. Stonewall Kitchen Holiday 2018 Holiday Jam, 12.5 oz. Polaner All Fruit Strawberry Spreadable Fruit 10 oz. Jar (Pack of 2) Gluten Free. Misty Meadows Scenic Oregon Jam Gift Set 6 pk.